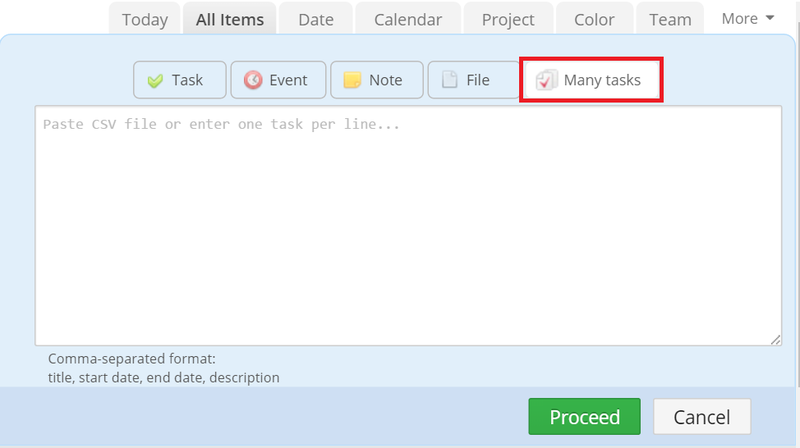 When you have to add a lot of tasks to your hiTask, it’s much easier to add them in bulk. You can do this by using the Many Tasks feature and add a .CSV file or simply list your tasks in this section. Copy the text from your file to the clipboard: Simply open the file, use Select All and Copy. Click the Enter item name field, then select the Many Tasks tab in your item types list. Next, simply paste a .CSV file in the box or enter your task list - which you have created as shown above. Something doesn’t look right? Click here to go back and change it. That is not an error. This means that you can go back if you want to review it. Otherwise if it looks good click Proceed and have your tasks created.